Links to this page can be found in Book 3 and Day 3. S. Lorenzo fuori le Mura (without the walls) is located outside Porta S. Lorenzo along Via Tiburtina, the road leading to Tivoli. 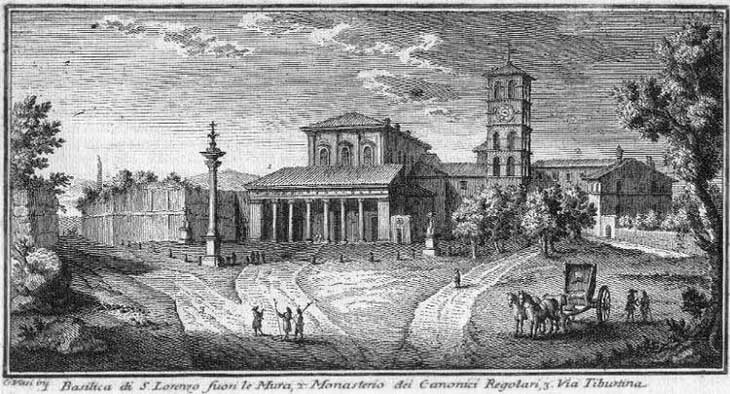 Because of its isolated position the basilica was surrounded by medieval walls, which were demolished in the XVIIth century; in 1704 the area in front of the church was redesigned with the erection of a column and two lateral pillars which were decorated with the heraldic symbols (three mountains and a star) of Pope Clement XI, the reigning pope. The view is taken from the green dot in the small late XIXth century map here below. 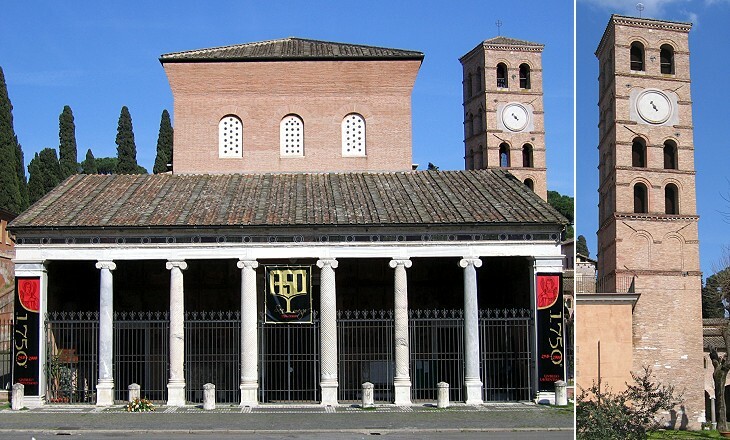 In the description below the plate Vasi made reference to: 1) Basilica di S. Lorenzo; 2) Monastery adjoining the Basilica; 3) Via Tiburtina. The small map shows also 4) Porta S. Lorenzo; 5) Portonaccio. A large cemetery (Campo Santo in the small map) began to be built behind the church and at its sides in the early XIXth century. In 1855-64, during the pontificate of Pope Pius IX, the façade of S. Lorenzo underwent significant changes which were designed by Virginio Vespignani and in 1865 a new column was erected. 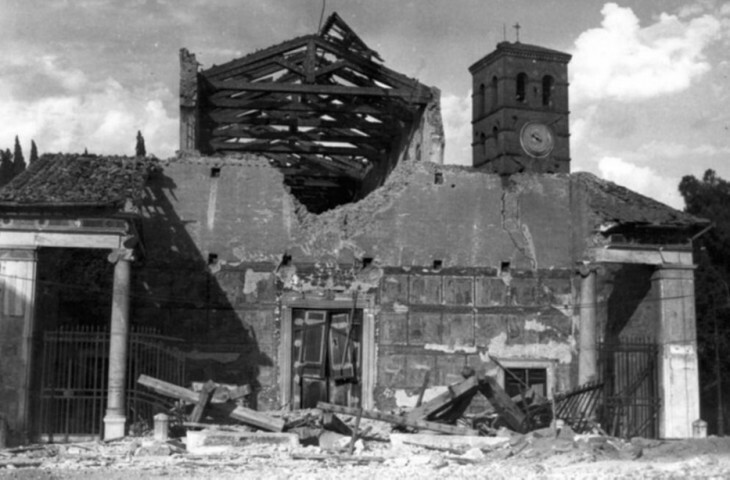 On July 19, 1943 the basilica was bombed by the Allies; the objective of the air raid was a nearby railway depot, but bombs fell on the façade and on the central part of the nave (it opens in another window); the bombs fell also on the highly populated area between the basilica and the depot causing more than 3,000 casualties. Besides the military objective, the raid was aimed at weakening the Italian government from a political viewpoint: six days later Mussolini was arrested and his regime fell. The reconstruction has eliminated all XIXth century additions, but today's upper part of the façade has a plain appearance which most likely it never actually had. You may wish to see the basilica as it appeared in a 1588 Guide to Rome or a 1575 etching showing S. Lorenzo still surrounded by walls. 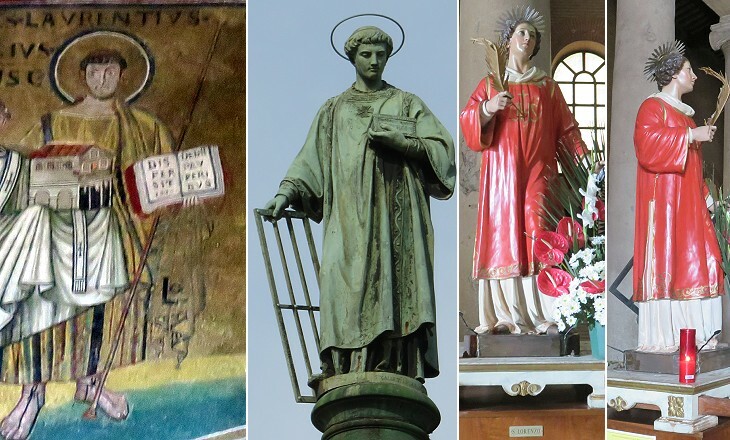 Of the many Roman historical churches dedicated to St. Lawrence, three are associated with his martyrdom; S. Lorenzo in Fonte was built above the prison where Lawrence was jailed; S. Lorenzo in Panisperna was built on the site of his martyrdom and S. Lorenzo fuori le Mura where he was buried. According to tradition Emperor Constantine ordered the construction of a large basilica above the crypt which housed the grave. In the late VIth century a second basilica was built by Pope Pelagius II at the side of the first one which was abandoned and eventually disappeared. Pope Pelagius II had to face hard times. At the time of his appointment in 579 Rome was sieged by the Longobards and his appeals to the Byzantine Emperors for help fell flat. Eventually the Longobards lifted the siege in an exchange for a large ransom of gold. In 589 a major flood struck Rome and in the following year a new outbreak of plague and a famine reduced the population of the city. Notwithstanding these difficulties the Pope managed to build and decorate a large basilica. Towards the end of the XIIth century Pope Clement III fortified the basilica and the small nearby burg (Laurentiopolis) by surrounding them with walls; a few years later Pope Honorius III (Cencio Savelli) built a new basilica on the back of the old one and this resulted in its orientation being changed; the VIth century basilica had the entrance facing the east (an orientation very common in the ancient temples), whereas after the changes made by Pope Honorius III the façade is on the west side of the building. The old part makes up the choir of the basilica and the new one its naves; the two sections are slightly misaligned. 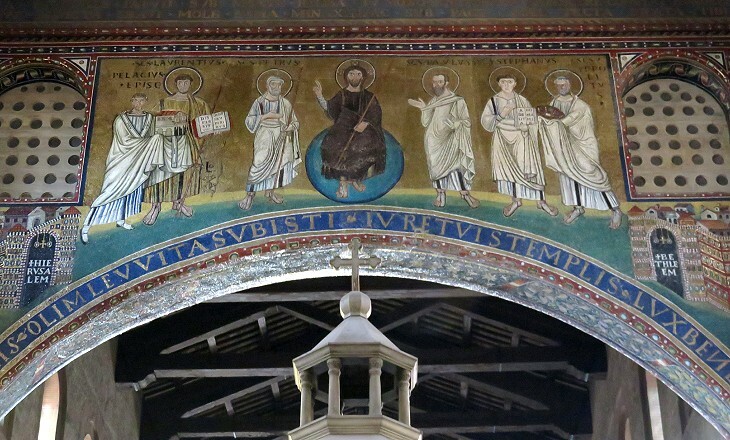 The old basilica had a matroneum, a gallery from where women (or perhaps catechumens) attended ceremonies, similar to what can be seen at S. Agnese fuori le Mura, S. Vitale in Ravenna and Hagia Sophia in Constantinople. 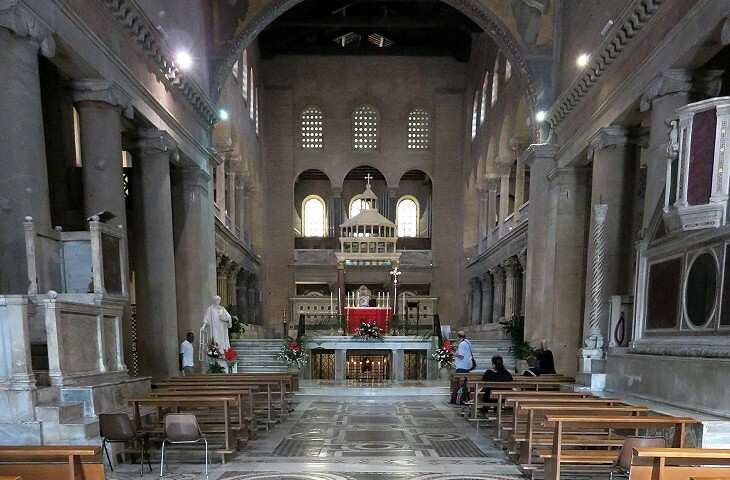 The floor of the old basilica main nave was raised in order to use its space as a choir. The apse, which most likely was decorated with mosaics, was pulled down; it stood over the catacombs where Lawrence was buried. An underground chapel leading to the catacombs was built at the junction between the new and the old basilica. It is named after Ciriaca, a Roman matron who owned the catacombs. Its decoration was completed in 1730, but it contains medieval and Renaissance works of art. 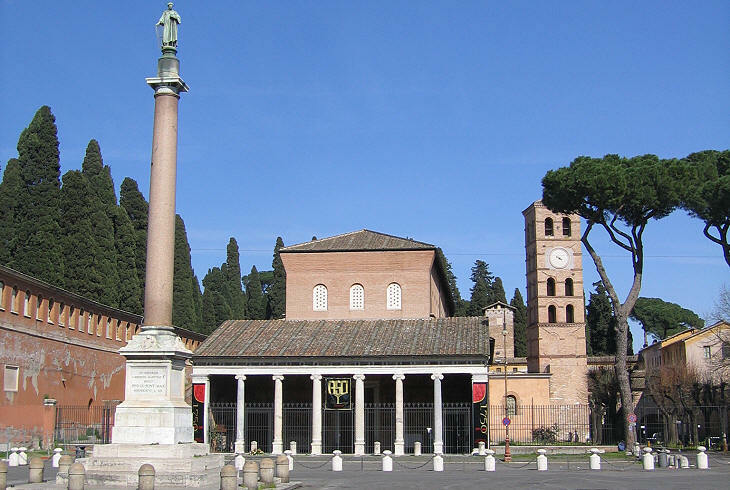 Ancient columns which most likely came from the abandoned basilica built by Constantine, were utilized for the enlargement of S. Lorenzo in the XIIIth century. 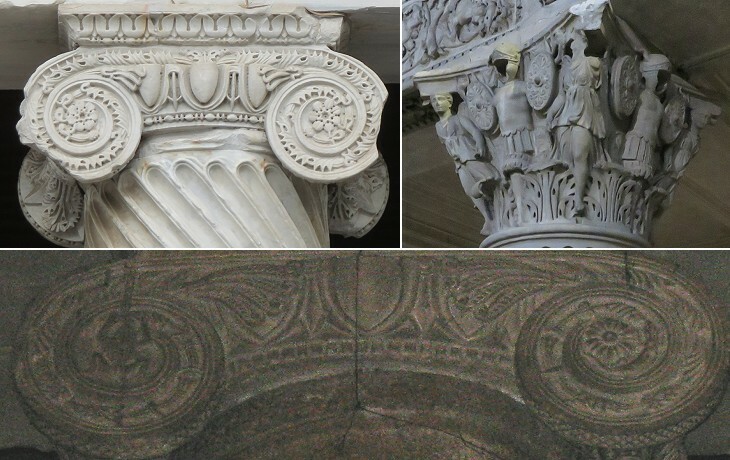 The Ionic capitals at their top however are attributed to the Vassalletto, a family of architects/sculptors/mosaicists, who were very good at imitating ancient architectural patterns. The decoration of one of their capitals led J. J. Winckelmann, the art historian who set the bases of Neoclassicism, to believe it was a work by two ancient sculptors and architects: Batrachus (frog) and Saurus (lizard). 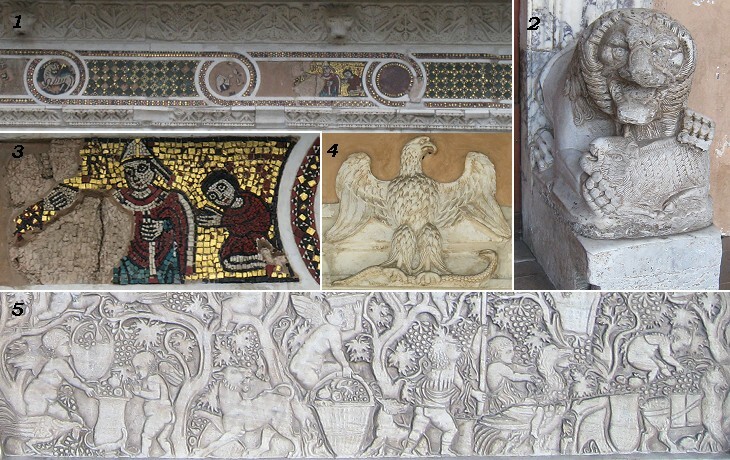 As a matter of fact it was not unusual during the Late Roman Empire to portray small animals inside a circular decoration (see an inhabited scroll frieze in Mardin) and the medieval sculptors copied that pattern. The capitals used for the section built by Pelagius II were taken from an ancient building, which was most likely dedicated to an emperor, because they are decorated with military trophies (similar to those you can see below in the page on an ancient sarcophagus). The portico is a very interesting mixture of ancient and medieval elements; it is attributed to the Vassalletto, who with the Cosmati family developed a type of decoration which is usually called Cosmati work; a small mosaic portrays the coronation of Pierre de Courtenay as Emperor of the Latin Empire which took place in S. Lorenzo in April 1217. Cardinal Guglielmo Fieschi was the nephew of Pope Innocent IV and he assisted his uncle during a very turbulent pontificate. He chose to be buried in a very fine IInd century AD sarcophagus portraying a wedding: in the right side of the relief the groom and the bride are portrayed during the dextrarum iunctio (clasping of the right hands), a key moment of the ceremony which preceded the passage of the bride to her new family which was formalized by the words Ubi tu Gaius, ego Gaia (Where you are Gaius, I will be Gaia); in the central part of the relief a sheep is about to be sacrificed; the stools upon which the groom and the bride sat while eating a ceremonial pie was covered with its skin (pellis lanata). Other Cosmati works, i.e. 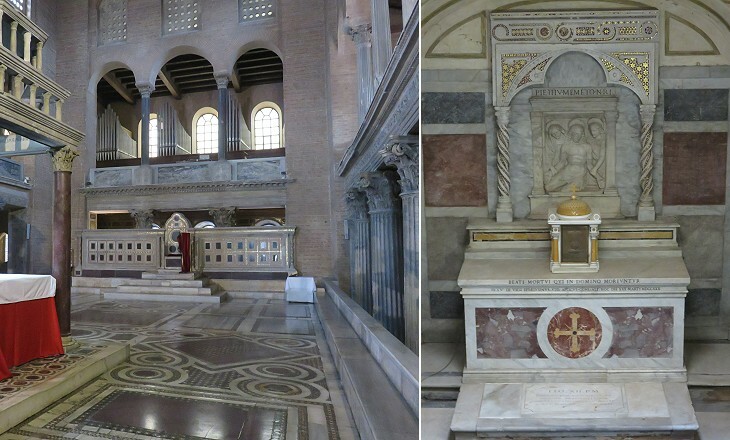 a pulpit and the papal throne, can be seen in the historical section and in the image used as background for this page. St. Lawrence was a native of Spain; was ordained Deacon by Sixtus II, when raised to the Pontificate in 257; and appointed by him the first among the seven Deacons of Rome, a sacred charge to which were attached the care of the treasury of the Church and the distribution of its riches among the poor. In consequence of the sanguinary edicts of Valerian against the Church in 257 the aged Pontiff was apprehended; and, when being led to execution, was met by his faithful Deacon, who, inflamed with a holy envy and burning with an ardent desire to share his martyrdom, burst into these pathetic words: "Father, whither goest thou without thy son? Whither goest thou, o holy priest, without thy deacon? Thou wert not wont to offer sacrifice without me thy deacon. Wherein have I displeased thee? try me now, and see if thou hast made choice of an unfit minister for dispensing the blood of the Lord." "I leave thee not, my son." - tenderly replied the holy Pope - "For thee, who art in the vigour of youth, are reserved a greater trial and a more glorious victory." You may wish to see a page on the iconography of the saints and another one depicting a number of martyrdoms (both with images of St. Lawrence). 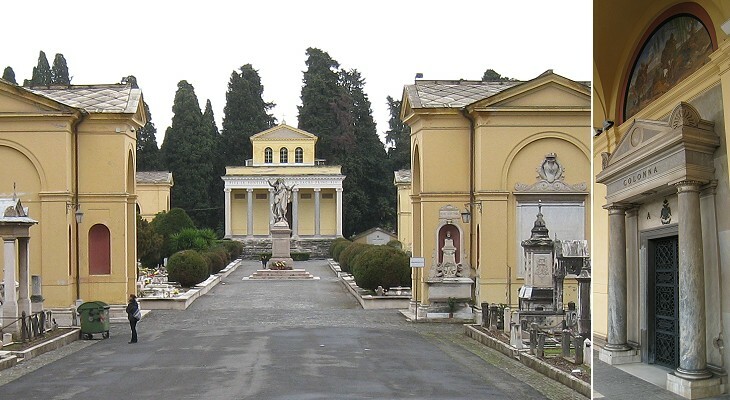 During the French annexation of Rome an Imperial decree forbade burial in churches and within settlements; the French started the construction of a large cemetery which surrounded on three sides S. Lorenzo fuori le Mura; the hygienic reasons behind the decree were understood by the popes whose rule was restored in 1814; however the part of the decree which limited the pomp and decoration of the tombs was disregarded and Pope Pius IX commissioned a large portico made up of a series of chapels for the richest families. 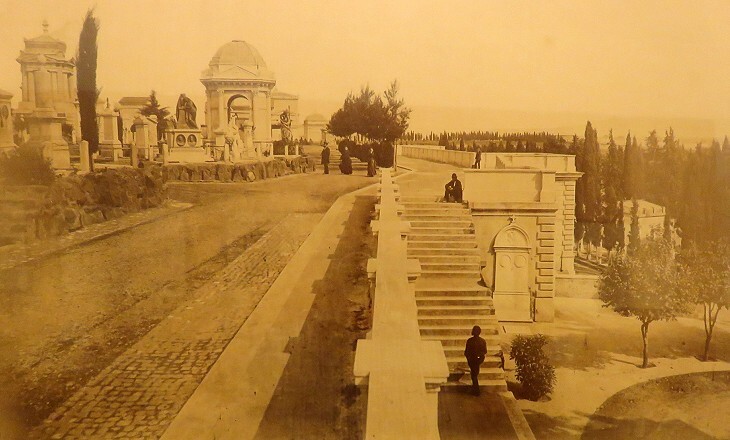 On June 14, 1870 Pope Pius IX inaugurated a Monument to the Fallen at Mentana, a small town near Rome where in 1867 his troops checked the advance of Garibaldi and his volunteers. The statues portray St. Peter in the act of giving a sword to a medieval knight. A few months later, on September 20, Italian troops entered Rome near Porta Pia. 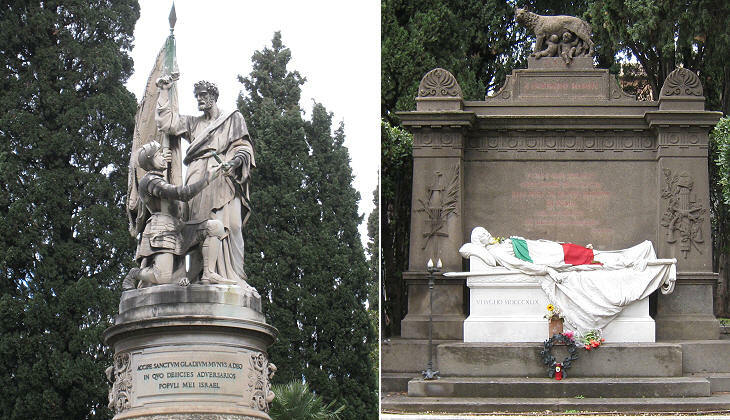 In 1891 the City of Rome built a monument to Goffredo Mameli, the author of the text of Fratelli d'Italia, the current Italian national anthem. He died in 1849 at the age of 22 during the Defence of the Roman Republic. "Portonaccio" means large and ugly door and it was a reference to a ruined arch of an aqueduct to the south of Via Tiburtina, which, similar to other ancient Roman roads, was flanked by tombs. In 1931 a very large sarcophagus was found in this location, today a densely populated neighbourhood of Rome. 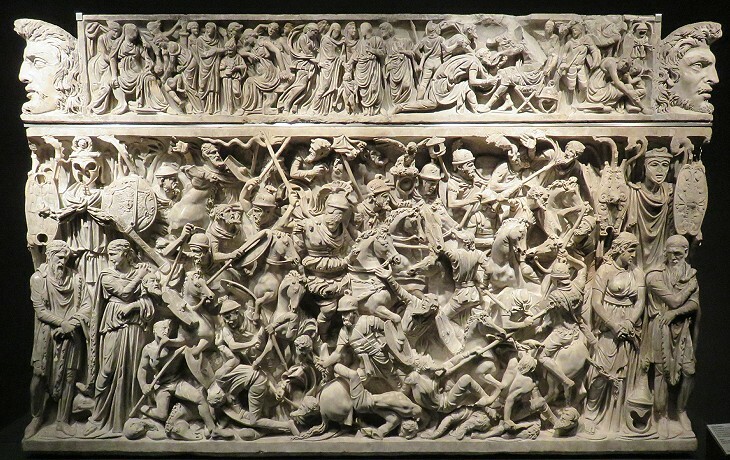 Its front is entirely occupied by a complex relief showing a fight between Romans and barbarians. It is dated late IInd century AD and it most likely depicts events of the military campaigns of Emperor Marcus Aurelius in today's Austria (the Emperor died at Vienna in 180 AD). 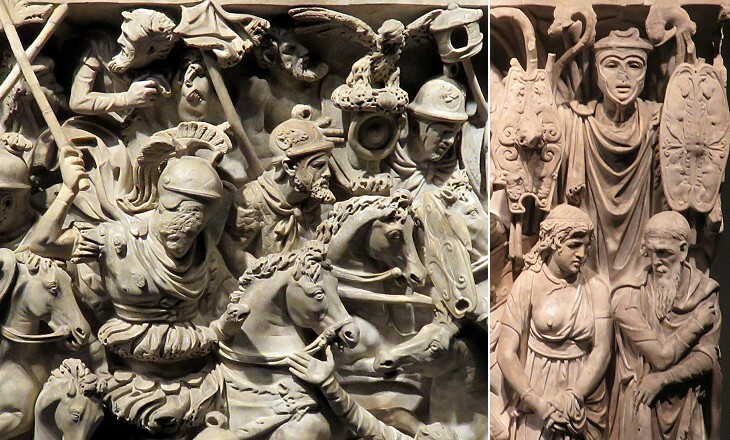 The style of the relief is similar to that of Colonna Antonina, which celebrated those campaigns. 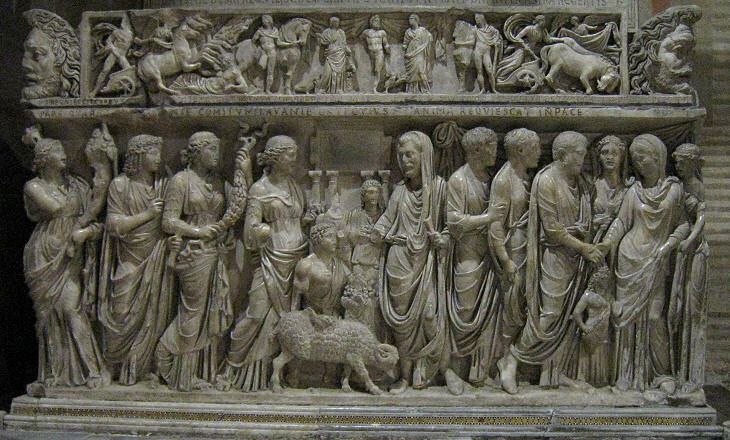 The face of the Roman commander at the centre of the scene was not finished and the sarcophagus does not bear an inscription. According to archaeologists it was not made to order, but it was produced to be offered on sale to a commander who had taken part in Marcus Aurelius' campaigns (you may wish to see another unfinished and unsold sarcophagus). The sarcophagus has some similarities with Sarcofago Grande Ludovisi, another large sarcophagus depicting a fight between Romans and barbarians, which was found near Porta San Lorenzo, not very far from Portonaccio. Heracles's last, and most difficult, Labour was to bring the dog Cerberus up from the Underworld. (..) Heracles found the dog chained to the gates of Acheron, and resolutely gripped him by the throat - from which rose three heads, each maned with serpents. The barbed tail flew up to strike, but Heracles, protected by the lion pelt, did not relax his grip until Cerberus choked and yielded. (..) Heracles dragged Cerberus, bound with adamantine chains, up to a subterranean path to sunlight. 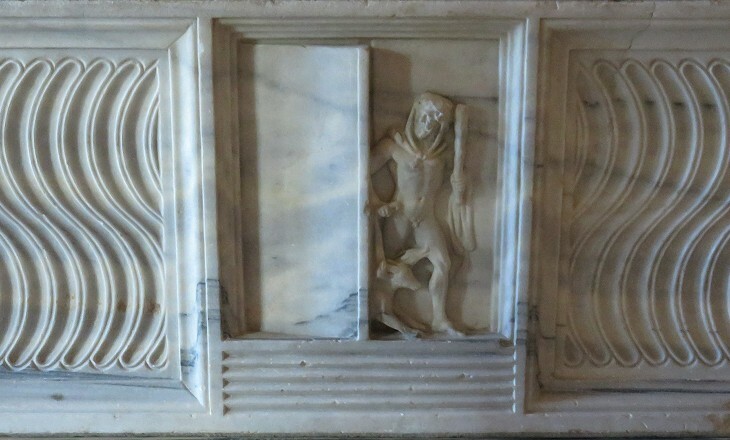 The depiction of Heracles returning from the Underworld indicates that the person who bought the sarcophagus hoped that one day he/she would return to life. The very early Romans worshipped Mother Earth; this cult did not fit into the formal religious scheme the Romans borrowed from the Greeks, but it surfaced from time to time. The small altar to the goddess is dated early Ist century AD, so it is almost the same age as the relief of Earth at Ara Pacis Augustae. 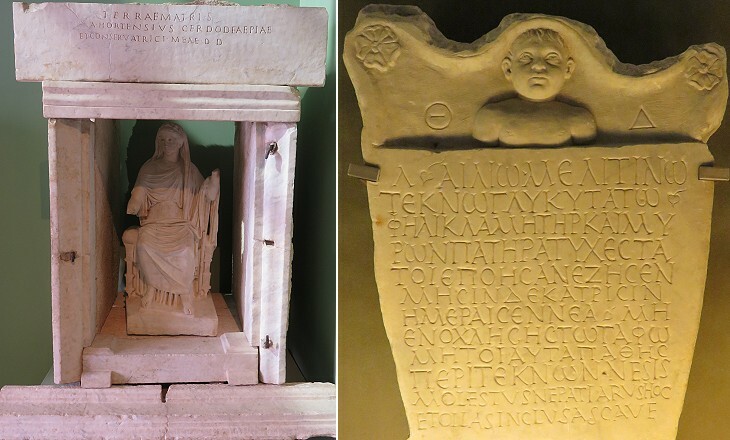 The parents of Lucius Aelius Melitinos, who lived 13 months and 9 days, came from the eastern provinces of the Empire and they expressed their grief in Greek. The last sentence however was an appeal not to damage their child's gravestone and was therefore written in Latin. Ne sis molestus, ne patiarus hoc, et ollas inclusas cave (Do not harm this gravestone and do not allow others to do it. Pay attention to the funerary urns it contains). 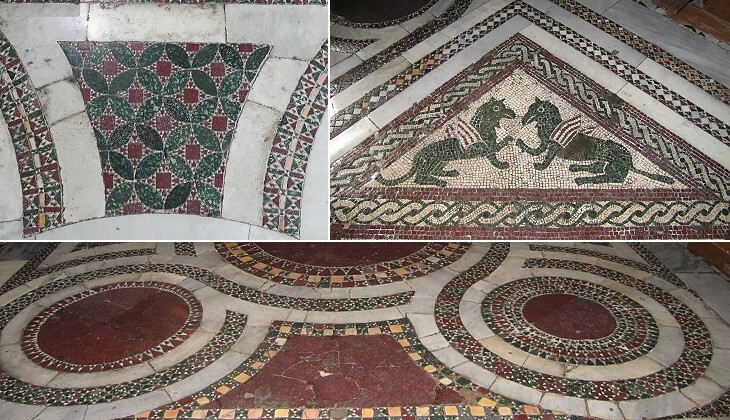 These two mosaics were found during the pontificate of Pope Alexander VII and in line with the practice of the time they were largely restored. The inscription is lost, but it was recorded. 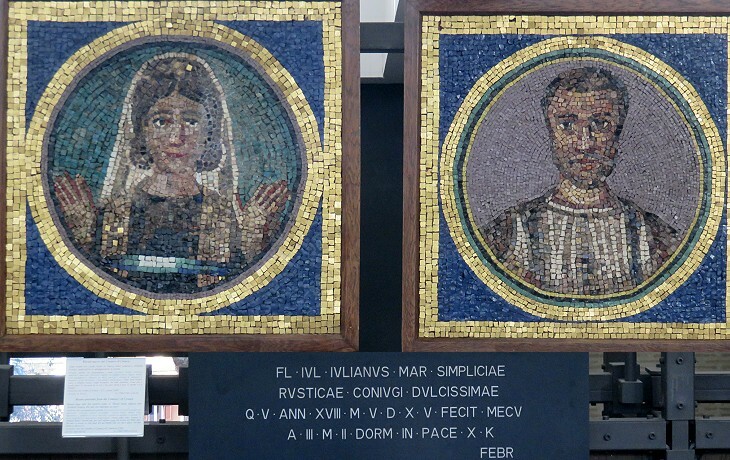 The mosaics were commissioned by Flavius Iulius Iulianus after the death of his young wife at the age of eighteen and after a marriage which lasted three years. Because of the location where they were found and because of the wife being portrayed while praying they are regarded as early Christian mosaics. Next plate in Book 3: Basilica di S. Maria Maggiore . You have completed Day 3. Move to Day 4! Nel campo Verano, ove fu sepolto il santo Diacono, si osserva questa santa Basilica in un sito basso e arenoso. Il suo Fondatore si crede essere stato il Gran Costantino, e poi da varj Pontefici fu ristaurata, e ornata di marmi e di pitture. Si osservano le bellissime colonne di marmo striate, e specialmente quelle nel coro, ed in mezzo il ciborio con 4. colonne di porfido, sotto cui riposa il corpo del s. Titolare con quello di s. Stefano protomartire: esistono in mezzo della nave i pulpiti marmorei, chiamati dagli antichi ambones su i quali leggevansi al popolo li Evangelj e l'Epistole nelle Messe solenni, e da piede sonovi due sepolcri alla gotica con bassirilievi di marmo. Il quadro nel primo altare a destra con alcuni santi, che vengono seppelliti è di Emilio Sottino; la s. Ciriaca nell'altra cappella, che pure seppellisce altri santi Martiri, è di Emilio Savonanzio, ed il quadro nel terzo altare è del suddetto Sottino; le pitture a fresco furono però fatte da Domenico Rainaldi. L'altare sotterraneo, che sta a destra della tribuna è molto celebre per essere il primo, che fosse privilegiato; appresso a questo corrisponde il cimiterio di s. Ciriaca, in cui seppelliva i corpi de' ss. Martiri: Il s. Lorenzo, che distribuisce i tesori della Chiesa a' poveri, e la decollazione di s. Gio. Batista sono di Gio. Serodine d'Ancona, e la ss. Vergine del sudd. Sottino; le pitture però a fresco sono di Gio. Antonio, e Gio. Francesco allievi del Vanni, e li due depositi presso al cimiterio sono di Franc. Fiammingo, col disegno però di Pietro da Cort. Si nota, che in questa chiesa Onor. III. coronò il Conte Auxerre, e Jole sua moglie per Imperatori di Costantinopoli.